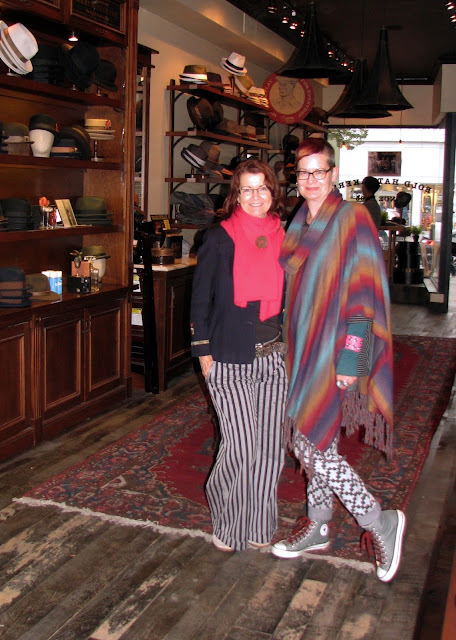 After seeing two films at TIFF, I met my friend Donna and we did a bit of looking/shopping along Queen Street West. It was cloudy, and cold, as you can tell from our layers in the photo below. We made stops at the Doc Marten Store and Kind Exchange, and then decided to check out some stores that neither of us had been in before. Donna had passed the Goorin Bros. Hat Shop on Queen West a few times but had never been inside. Stepping through the front door felt like we had been transported 50 or 60 years into the past (in a good way, without the dust or musty smell). Goorin Bros. was started in 1895 by Cassel Goorin, who used to sell his custom-made hats off his horse cart in Pittsburgh. When Cassel's two sons took over the business in 1921, it became Goorin Bros. In 1949, the company headquarters moved to California, and the company became known across America for their quality hats. In 2006, Cassel Goorin's great-grandson took over the company and continued the legacy of creating stylish hats that reflect the wearer's personality. 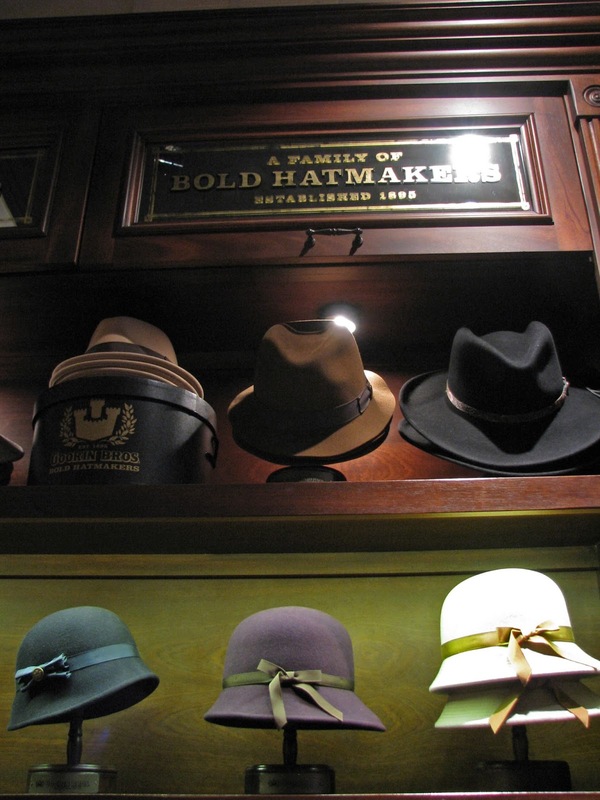 The store was decorated with beautiful woodwork and subtly lit displays of hats for sale. Even the hat boxes, which were black with gold lettering, were stylishly elegant. Some of the men's and women's hats for sale in the shop. The selection for women feature classic shapes like the cloche, floppy and pillbox. This young woman who was working in the shop seemed to find us as charming as we did her. 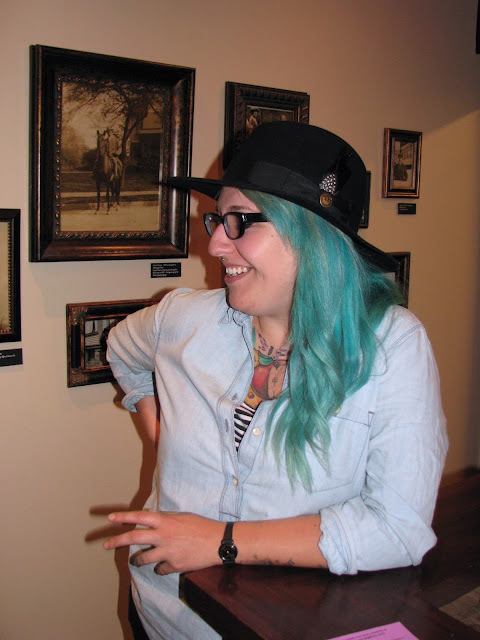 She was rocking a western/outback style fedora that looked perfectly modern paired with her turquoise hair. Goorin Bros Hat Shop is located at 320 Queen Street West in Toronto. 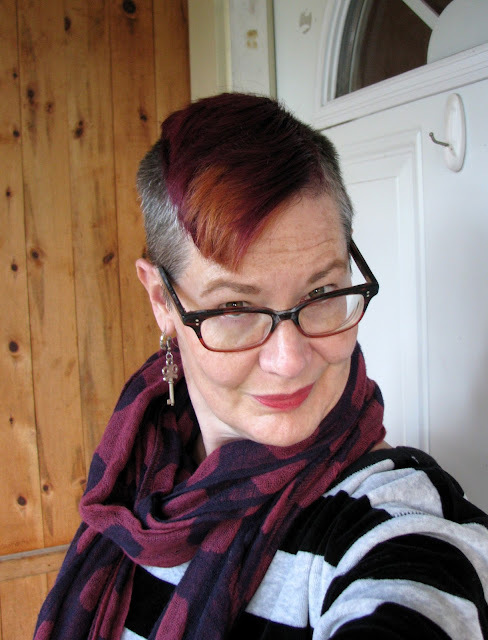 I had got a new haircut last week. I haven't had bangs for years, so it will be interesting to see how I feel about having hair on my forehead, even if it's only a chunk. I like it though, and it got good reviews from people I didn't know when I was in Toronto. I found this cozy velour sweatshirt/dress at Kind Exchange and wore it to work this week, styled like this. It's kind of short but I don't think I flashed anyone, at least not intentionally. Stripes! Polka Dots! Stars! Flowers! Skulls! It's all good. I am loving your hair, that blanket, and those over the knee socks--I have a huge love of over the knee socks!!! Those hats are killer. 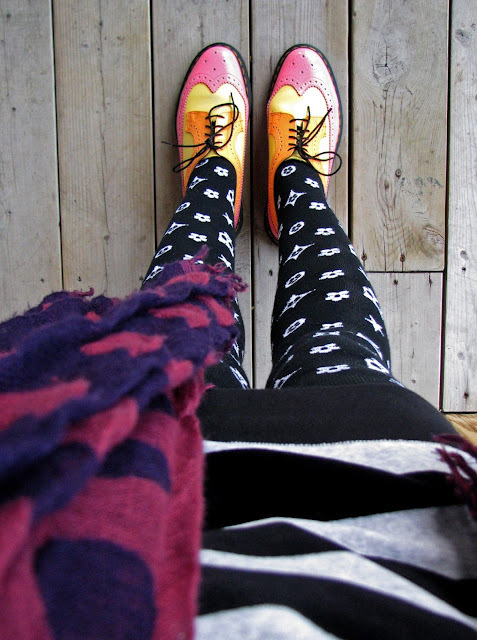 Loving your outfit and adore your Doc 's ! Your hair looks fantastic, I love it, you look naughtier than ever! Great new cut. Love the color too. Happy to see that you checked out a hat shop during your time in Toronto. We have the same shop here in Denver, and I enjoyed learning their history. Loving the over-the-knee socks on you, with your striped dress and colorful shoes. I'm sure that the people that you work with look forward to your amazing self expression. I love the new haircut!! You stripey dress and socks is just magical!! And if you did happen to flash anyone--well they got an extra treat!! LOVE the new hair, and those awesome shoes. Ok, I am into the whole ensemble. You are dressing to express! it's a trend! The Doctor wore a stripped shirt and polka dot tie today, no stars. Well, of course the young woman in the shop thought you and Donna were charming - you are! The hat shop looks fabulous, I love heritage brands and shops which take their craft, and their service, seriously. Great haircut, you look very cool, Shelley! Are you used to having a fringe yet? You definitely suit a shorter length (flashing optional) of dress/skirt - if you've got amazing legs, you may as well let the world know! You have a fabulous cape girl! Your hair looks great! Wish I had the nerve to do something adventurous with mine. Fantastic hair cut! I know I've swooned over those docs before, but I'm doing it again. I love them. Love those hats at the hat makers. Your hair pairs perfectly with the outfit. Thanks for posting the photos and feel free to drop by me too anytime. You have such amazing shops in your area. I'm so jealous. Love your outfit and those very fab shoes. Gams and bangs! First, your bangs looks wonderful. There must be a better word to describe them when they are also so marvellously coloured as well. Glad you made it to TIFF. I love your hair! And your poncho! and the hats!